قنبری, سجاد, حفیظی, محمد کاظم. (1395). کاربرد مدل‌سازی پیشرو و الگوریتم پردازشی مناسب در تعیین محل قنات به روش GPR. مجله ژئوفیزیک ایران, 10(2), 67-82. سجاد قنبری; محمد کاظم حفیظی. "کاربرد مدل‌سازی پیشرو و الگوریتم پردازشی مناسب در تعیین محل قنات به روش GPR". 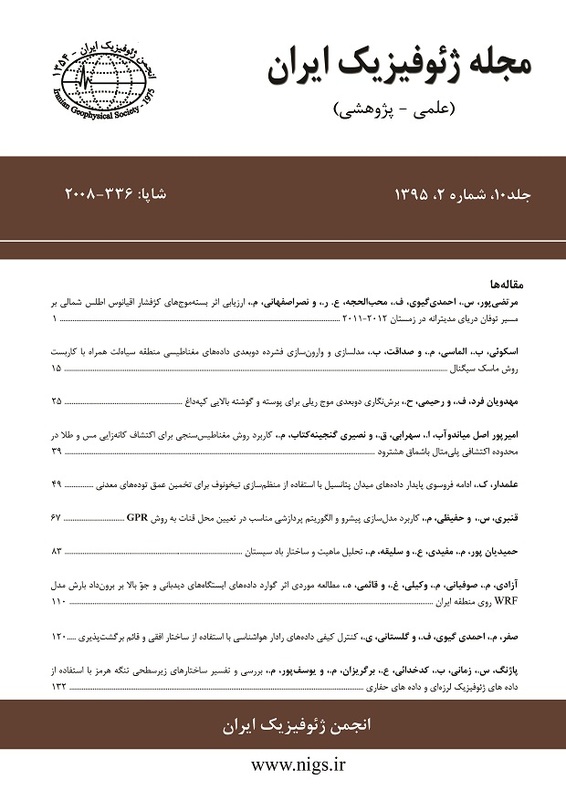 مجله ژئوفیزیک ایران, 10, 2, 1395, 67-82. قنبری, سجاد, حفیظی, محمد کاظم. (1395). 'کاربرد مدل‌سازی پیشرو و الگوریتم پردازشی مناسب در تعیین محل قنات به روش GPR', مجله ژئوفیزیک ایران, 10(2), pp. 67-82. قنبری, سجاد, حفیظی, محمد کاظم. کاربرد مدل‌سازی پیشرو و الگوریتم پردازشی مناسب در تعیین محل قنات به روش GPR. مجله ژئوفیزیک ایران, 1395; 10(2): 67-82. روش رادار نفوذی به زمین (GPR)، به دلیل توان بالای تفکیک، سرعت‌ زیاد در برداشت داده‌ها و غیرتخریبی بودن، بهترین روش نسبت به سایر روش‌های ژئوفیزیکی برای مطالعات نزدیک به سطح است. یکی از موارد مناسب برای مطالعه با این روش، تعیین محل گالری قنات‌های آب‌دار نزدیک به سطح به دلیل تباین قابل ‌توجه ویژگی‌های الکتریکی و الکترومغناطیسی قنات آبدار نسبت به محیط اطراف آن است. به ‌همین منظور، یک مطالعه دوبعدی با برداشت داده‌ها در منطقه مشکان کاشان و با استفاده از آنتنی با بسامد مرکزی 250 مگاهرتز انجام پذیرفت. در رادارگرام اولیه، نشانه‌های مربوط به هدف مورد نظر به‌خوبی مشاهده نشد. ازین‌رو، هدف این مقاله با توجه به شرایط قنات مذکور، بر آن بوده است که ابتدا با مدل‌سازی پیشرو و سپس با اعمال پارامترهای پردازشی مناسب، تا حد امکان به اهداف موردنظر نزدیک شویم. رادارگرام مطلوب نهایی با به‌کارگیری پارامترهای پردازشی مانند تصحیح اشباع سیگنال، صافی‌های میان‌گذر، بهره جبران نمایی و گسترش هندسی و بردارنده زمینه، به‌دست آمد. خاک منطقه شامل مقادیری از ماسه، گراول و سیلت بوده و میانگین مقاومت ویژه الکتریکی آن تقریباً برابر 200 اهم‌متر است. تحلیل سرعت سیر موج برای تعیین عمق قنات، بر اساس محاسبه مقدار میانگین سرعت امواج با توجه به جنس زمین منطقه مورد مطالعه، انجام پذیرفته است. در پایان، همخوانی مناسبی میان برونداد مدل طراحی‌شده و نتایج حاصل از تفسیر رادارگرام و شرایط واقعی زمین مشاهده شد. همچنین توانایی GPR با توجه به عمق کم هدف مورد نظر و وضوح‌ بالای موردنیاز به‌خوبی به اثبات رسید. As a high resolution, nondestructive and rapid geophysical tool, Ground Penetrating Radar (GPR) provides the best method that can be used for locating superficial targets. A gallery of the aqueduct is well locatable by the GPR method due to distinct permittivity contrast between the target and the surrounding media. In this research work, as a 2D study, the GPR data acquisition was carried out using 250 MHz shielded antenna in Mashkan area near Kashan city. The target is not well visible in any processed radargram obtained from data acquisition. This paper aims at achieving the best processed section that is strongly similar to real conditions of the subsurface. In this circumstance, the proficiency of suitable processing algorithm will be very useful. To evaluate the ability of GPR, in addition to the suitable processing and appropriate interpretation of actual data, a model that is required based on the conditions of the subterranean features is designed and implemented. What is more prominent in this paper than that in previous similar studies carried out in Iran is the manipulation of modeling in GPR method and comparison of the results with the interpretation of actual data. In modeling, we generally tried to make the best simulation of wave reflection received from the underground layers obtained through the propagation of electromagnetic waves according to the targets and anomalies. Therefore the purpose of this article, according to the properties of the mentioned aqueduct, is to apply forward modeling and designing of model based on the expected conditions of the study at first. Then we want to investigate responses of electromagnetic waves when the processed section has been made by appropriate processing parameters. In this paper, modeling has been done based on a finite difference method. We can simulate complex consequential answers from complicated cases inasmuch as it has benefits such as flexibility, ability to simulate and model complex environments. Further, this method has acceptable responses as seen in cases when compared to other numerical methods, and it is more practical. The finite difference time domain (FDTD) method can model with high accuracy, when the properties of the underground layers are concerned. The final congenial model is acquired based on the characters of the layers, several parts and boundaries of this case study. The mentioned areas have been divided into cube-shaped sections named orthogonal grid cells. For each cell, the intensity of the electric and magnetic fields are considered according to the vertical and horizontal components of the invariable electromagnetic fields on the basis of the measured values of physical properties and the soil type. The resulting radargram is achieved through processing parameters such as Dewow filter, Spreading and Exponential Compensating (SEC), band-pass filtering and background removal. The soil of the study area contains sand, gravel and silt with an average electrical resistivity of about 200 Ωm. The analysis of traveling velocity of the electromagnetic wave is implemented using average electrical permittivity according to components of the soil. Our results show a close agreement between the model and the processed radargram, which consequently implies that the proposed processing procedure indeed provides reasonable results. اسحاقی، ا.، کامکار روحانی، ا.، و عرب‌امیری، ع.، 1392، مقایسه و تلفیق نتایج پردازش، مدل‌سازی و تفسیر داده‌های توموگرافی الکتریکی و GPRبرای شناسایی اهداف و ساختارهای زیرسطحی کم‌ژرفا: مجله علوم زمین، 92، 10-3. کامکار روحانی، ا.، اسحاقی، ا.، و عرب‌امیری، ع.، 1391، پردازش و تفسیر داده‌های رادار نفوذی به زمین (GPR) به‌منظور شناسایی حفره‌های زیرسطحی و بررسی لایه‌بندی، دانه‌بندی و برآورد میزان رس در رسوبات زیرسطحی کم‌عمق: مجلة فیزیک زمین و فضا، 38(4)، 173-155. محمدی ویژه، م.، و کامکار روحانی، ا.، 1389، بررسی ساختارهای مدفون نزدیک سطح زمین با استفاده از روش‌های GPR و مقاومت ویژه: یک مطالعه موردی: مجله علوم زمین، 80، 170-163. Alford, R. M., Kelly, K. R., and Boore, D. M., 1974, Accuracy of finite difference modeling of the acoustic wave equation: Geophysics, 39, 834–842. Arft, C. M., and Knoesen, A., 2004, An efficint finite-difference frequency-domain method including thin layers: Microwave and Optical Technology Letters, 43(1), 40 - 44 . Bano, M., 1996, Constant dielectric losses of ground-penetrating radar waves: Geophys. J. Int., 124, 279–288. Bitri, A. and Grandjean, G., 1998, Frequency- wave number modeling and migration of 2D GPR data in moderately heterogeneous dispersive media: Geophysical Prospecting, 46, 287–301. Chen, H. W., and Huang, T. M., 1998, Finite-difference time-domain simulation of GPR data: J. Applied Geophysics, 40, 139–163. Conyers, B. L., 2004, Ground Penetrating Radar for Archaeology: Altamira Press. Daniels, D. J., 2004: Ground Penetrating Radar: The Institution of Electrical Engineers Press. Davis, J. L., and Annan, A. P., 1989, Ground-penetrating radar for high resolution mapping of soil and rock stratigraphy: Geophysical Prospecting, 3, 531–551. Nabighian, M. N., 1991, Electromagnetic Methods in Applied Geophysics — Theory, Vol. 1: SEG Publication, Tulsa, OK, 513 pp. Parasnis, D. S., 1997, Principles of Applied Geophysics: Chapman & Hall, Landon, 420 pp. Radzevicius, S. J., Guy, D. E., and Daniels, A. J., 2000, Pitfalls in GPR data interpretation: Differentiating stratigraphy and buried objects from periodic antennae and target effects: Geophysics Research Letters, 27, 3393–3396. Reynolds JM (1997): An Introduction to Applied and Environmental Geophysics. - Wiley, pp.796. Sun, J., and Young, R. A., 1995, Recognizing surface scattering in ground-penetrating radar data: Geophysics, 60, 1378–1385. Sensors and software, 1999, Ground Penetrating Radar Survey Design. Sensors and software, 1999, Pulse EKKO 100 RUN User’s Guide, Version 1.2. Sensors and software, 1999, Win_EKKO User’s Guide, Version 1.0. Von Hippel, A. R., 1954, Dielectric and Waves: Chapman & Hall, Wiley, New York, 284 pp. Companion book: Dielectric materials and applications, pp. 276–277. Tzanis, A., 2010, MatGPR Release 2: A freeware MATLAB package for the analysis & interpretation of common and single offset GPR data: Fast Times, 15(1), 17–43. Zeng, X., McMechan, G. A., 1997, GPR characterization of buried tanks and pipes: Geophysics, 62, 798–806.